A quirky heist movie wrapped into an unlikely love story, Henry's Crime adopts a low key approach and serves up a fine mixture of drama, comedy and romance. 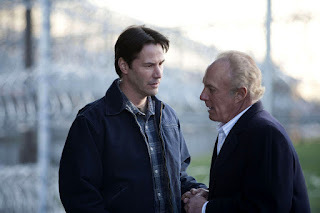 In Buffalo, Henry Torne (Keanu Reeves) is a highway toll booth attendant, very much at an emotional dead end. His soulless life is disconnected from any dreams or ambitions, and he is oblivious to his wife Debbie (Judy Greer) wanting to start a family. When old high school friends Eddie Vibes (Fisher Stevens) and Joe (Danny Hoch) come calling, Henry almost sleepwalks his way into being the getaway driver for a botched bank hold up. He is caught and sentenced to three years. His cell mate is long-term prisoner Max (James Caan), a grizzled con man now much more comfortable behind bars than in the real world, and the two men become friends. Debbie leaves Henry, who serves his time and decides to do something with his life. When he revisits the scene of the attempted bank robbery, Henry is accidentally struck by a vehicle driven by Julie (Vera Farmiga), an actress rehearsing for Chekov's The Cherry Orchard in a theatre across the street. From an old newspaper article Henry discovers that a prohibition-era tunnel connects the theatre and the bank, leading straight into the vault. He decides to rob the bank in a plan that will involve Max, Julie, Joe, plenty of digging, amateur theatrics and some unwanted plot crashers. An independent film directed by Malcolm Venville and co-produced by Reeves, Henry's Crime is an elegant story of transformation. The ending may be a bit contrived and the attempts at some comic farce come across as forced. But Venville taps into a rich vein of cool serenity, and lovingly places at the heart of his film three characters who are well worth knowing. The script by Sacha Gervasi and David N. White zooms into the lives of Henry, Max and Julie, and finds three sympathetic people ready for a change. Henry's life was at a standstill before he went to prison, and having served the time and lost his wife, he finally decides that he may as well enjoy the thrill of committing the crime. Henry's slow paced thought process is perfectly suited to Reeves' deliberate method of almost non-acting. Max injects the animation as the confidence man now short of confidence and happy to spend the rest of his life behind bars, despite being eligible for release. Henry offers Max a no-lose proposition: get out, commit a crime, get caught and go back to prison, where Max wants to be anyway, or evade capture and make it rich. James Caan rolls back the years and delivers a cleverly engaging performance, giving Max plenty of sarcastic wisdom from the school of hard knocks. And Julie also wants out, in her case out of Buffalo towards Hollywood. Julie is cold and her acting talent is limited at best, but she at least talks the good talk about seeking a bigger dream. In Henry she finds a man who may light the flame in her heart, but as luggage goes, Henry, a convict planning a heist, is carrying plenty. Vera Farmiga delivers a lively performance befitting a stage actress labouring to please an imperious director (played with panache by Peter Stormare). The three characters provide Henry's Crime with softly glowing core, and they play off each other with wacky humour. The film never takes itself too seriously, and thrives off an undercurrent of character-driven wit. Meanwhile life works hard at imitating art, The Cherry Orchard rehearsals providing an apt backdrop for unfolding modern day weirdness. The dreary Buffalo setting encourages thoughts of new beginnings anywhere else, while a bouncy soundtrack and music score by Blake Ley rounds out the movie's relaxed vibe. Henry's Crime may not be perfect, but it's an enjoyable frolic.